One of Strongwell’s most useful online design tools, the Strongwell Design Manual, is now available in metric format for international customers. 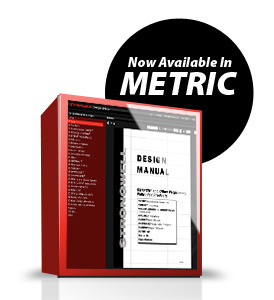 Design Manual users can now enjoy 24-hour access to the new metric manual containing conversions of the important information that Strongwell has provided design professionals for years. In the new Metric Design Manual, designers can find metric calculations for the properties, tolerances, elements of sections, load tables and safety factors of most of Strongwell’s fiberglass products, as well as access to CAD Blocks and MSDS documents. Now international customers can enjoy the same luxury with all metric design information at their fingertips. When signing into the Strongwell Design Manual, any users outside of the United States will now have instant access to the Metric Design Manual. The program has been designed for easy navigation and to ensure Design Manual users will never have to worry about using outdated documents. Users can access and print the most up-to-date design documents 24 hours a day, 7 days a week. To learn more or sign up to use the new Strongwell Metric Design Manual, visit www.strongwell.com/designmanual.